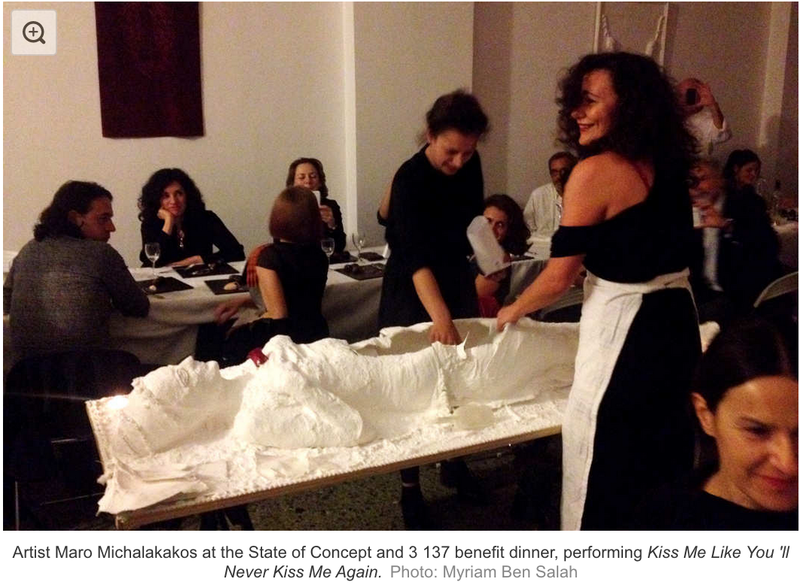 Artist Maro Michalakakos conceived the party as her own funeral and displayed a plaster version of herself full of delicious and sacrilegious Koliva (a ritual food made of boiled wheat, almonds, ground walnuts, cinnamon, sugar, pomegranate, and other sweetnesses), used exclusively during funerals and memorial services. The 20-euros menu included bread baked by one of the curators, sautéed cuttlefish prepared by one artist’s mother, homemade lemonade, and a dessert as explicitly sexual as mouthwatering offered by pastry chef Stelios Parliaros. Suffice it to say, the situation had nothing to do with the usual one-month-rent costly and slightly dull institutional benefit dinners. Despite the funeral theme, the party felt more like a cozy wedding with close friends, family, and delicious homemade party favors.